Thank you for your interest in the University of North Alabama (UNA)! We are proud to offer over 140 majors, minors, and concentrations at the graduate and undergraduate levels, including many online programs and course offerings. Whichever you choose, you will be gaining a quality educational experience with a personalized approach. Our dedicated and highly credentialed faculty members are both experts in their respective fields as well as innovative classroom teachers. Students can also gain and apply knowledge and skills outside the classroom through a host of study abroad, internship, and service learning opportunities and options. Many of our degree programs boast prestigious and selective disciplinary accreditation that distinguishes UNA from many peer institutions. 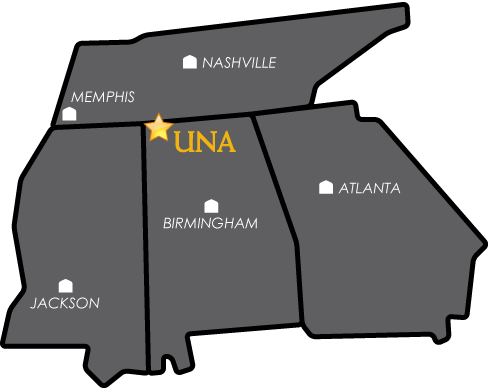 As a leader in academic innovation, UNA is constantly evolving and adding graduate and undergraduate degree programs in multiple modalities that appeal to students and learners of all ages, providing them with the skills and experiences they need to succeed in a constantly evolving and changing world. We would love for you to join our university community. We look forward to hearing from you. Roar Lions!